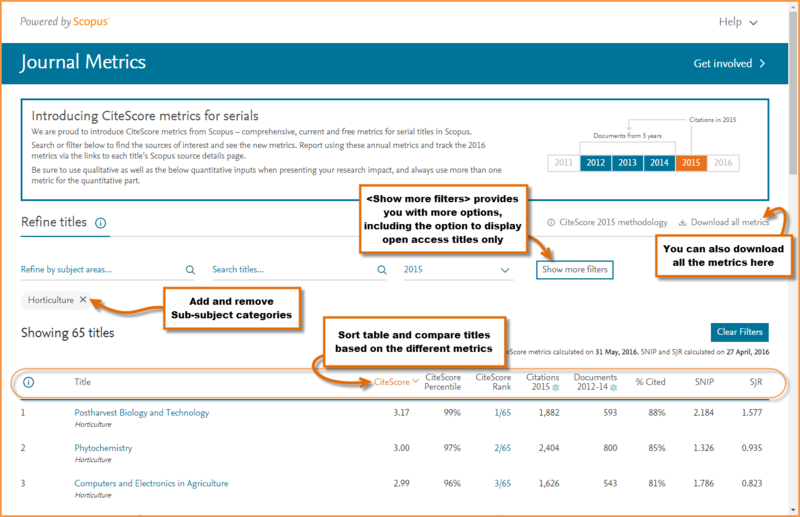 If you want to delve into the details and interrogate metrics for a singular title, start on Scopus itself: https://www.scopus.com/sources. Here you can search for a particular title and then access the metrics and underlying data. 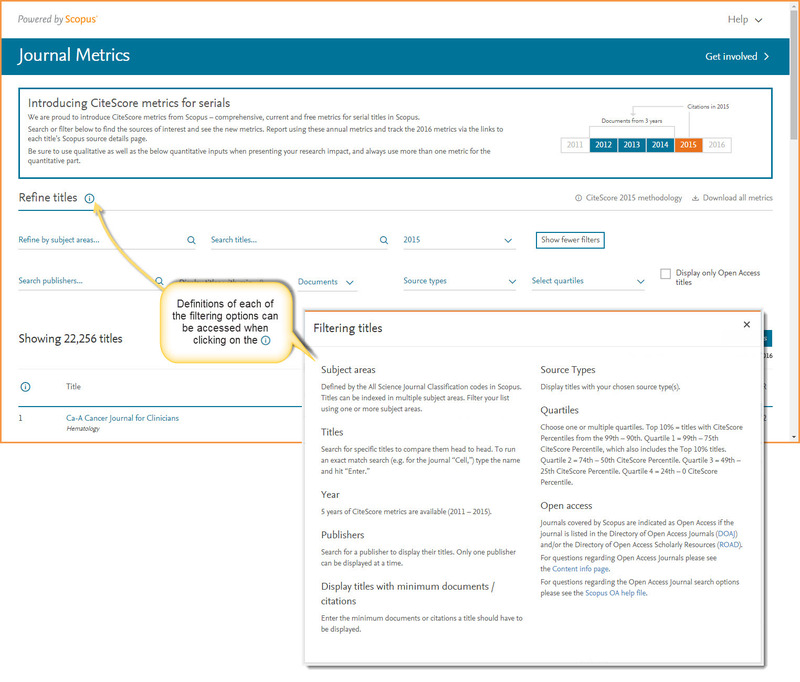 Journalmetrics.scopus.com includes search and filter features allowing you to explore the full range of associated CiteScore metrics for a group of journals at one time. 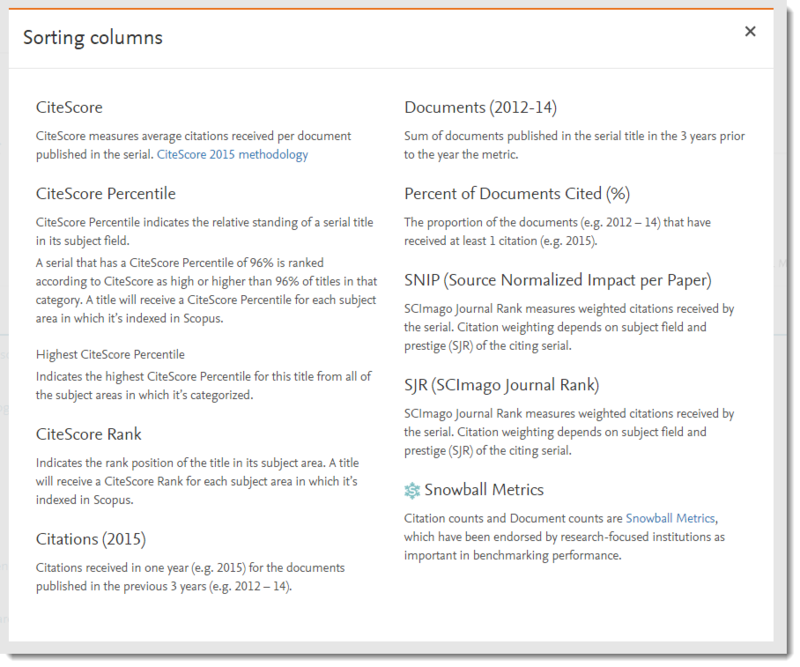 For example, here you can compare CiteScore metrics, along with SNIP and SJR values, for all journals in a specific subject category. You can also download all the metrics as one spreadsheet. Let’s say you are looking for quantitative information on titles in a particular Subject area. To do this, start on journalmetrics.scopus.com and go to <Refine titles> (see Figure 1). In this example, we will refine by subject area, but you can also choose different ways to filter by clicking on <Show more filters> and even build your own list to compare by searching for and adding specific titles. Each title is indexed in at least one Scopus ASJC category. There are over 300 sub-subject areas in Scopus, which aggregate up to 27 subject level categories. As an example, if I wanted to look at titles in the sub-subject category Horticulture, I would find and select it from under the subject area Agricultural and Biological Sciences. In this view, you can see and compare all the titles — including journals, books series, conference proceedings and trade journals — indexed under Horticulture. Note: You can also sort by the various metric categories. For example, rather than looking at the list ordered by highest CiteScore Rank, you could click on % Cited to discover which titles have the largest proportion of documents that have received at least 1 citation (See figure below). Again, under the <Show more filters> button, you can refine and change your view to gain different insights such as looking at rankings for past years, or limiting by Source type, particular quartiles, publishers, and more. There is also a box to <Display only Open Access titles>. 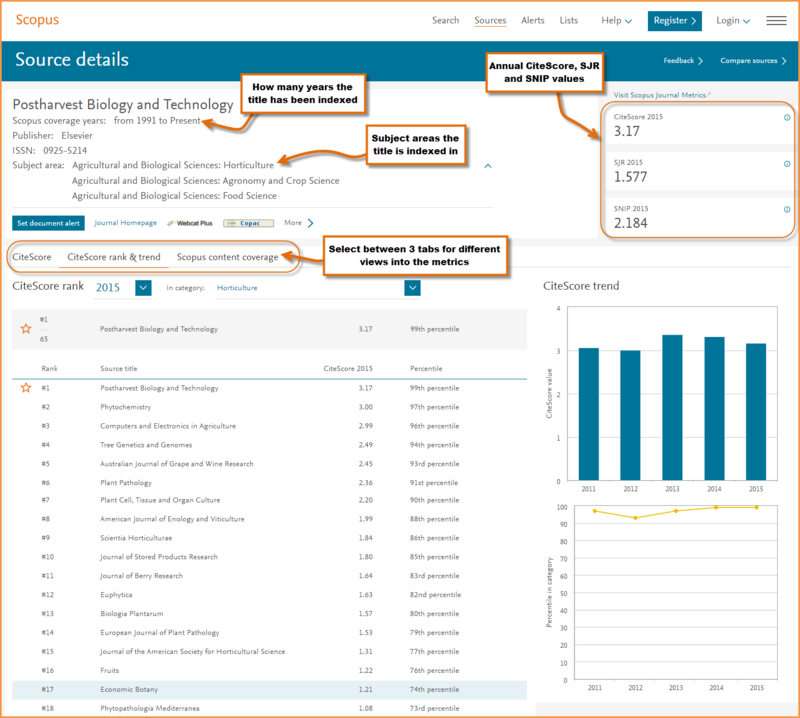 Once you’ve identified a particular title (or titles) that interests you, click on the title name to link into the details page on Scopus. Scopus coverage years: tells you how many years a title has been indexed in Scopus, so you know how far back coverage extends and what is being used to calculate CiteScore. 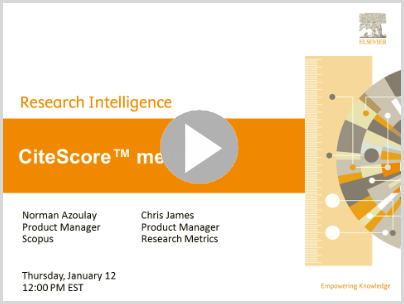 CiteScore Rank & Trend tab: view how a title ranks in different subject areas and graphically see CiteScore and CiteScore subject area percentile trends. This tab can be helpful in determining if a CiteScore value is good when compared to other titles in the same subject area. Scopus content coverage: provides the total number of documents published for a title for each year it has been indexed in Scopus. CiteScore Tracker provides a preview of what CiteScore 2016 is looking like so far. It is based on current data in the Scopus database. It allows you to see how many documents we have currently indexed in the previous 3 years, and how many citations those documents have received currently in 2016. The number will continue to build over the year as more documents are indexed and cited. The data in the Tracker is updated monthly all the way up until the official 2016 CiteScore value is calculated. 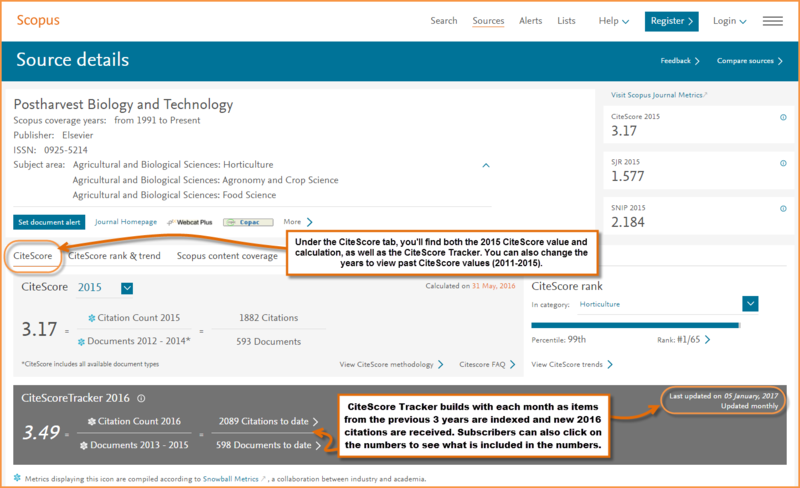 Subscribers can also click into the CiteScore Tracker numbers to see what documents are indexed.